Documentation for the CTD data collected on RRS Challenger 89/92 (February - March 1992) by the Dunstaffnage Marine Laboratory, Oban, Argyll, Scotland, UK, under the direction of D. J. Ellett. Line HE is a survey section in the Sea of the Hebrides, heading from Loch Bracadale (Isle of Skye, Scotland) in a south - south westerly direction towards the Isle of Canna. The line comprises five fixed CTD stations, which were established as part of routine monitoring work on the Scottish continental shelf by Dunstaffnage Marine Laboratory (DML). The line was occupied between the late 1970s to early 1990s. Line HE has also occasionally been referred to as Line H.
Station HE5 is one of five fixed CTD stations heading south to south-west from Loch Bracadale (Isle of Skye, Scotland) into the Sea of the Hebrides. The station was established by scientists at Dunstaffnage Marine Laboratory (DML). The Sea of the Hebrides lies between the southernmost islands of the Outer Hebrides and, to the east, the northern Inner Hebridean islands and Scottish mainland. This area of the shelf has been surveyed since the mid 1970s by numerous research and government institutes. The region contains many repeated hydrographic stations, which collectively form transects. These repeated survey transects form part of a greater network of similar sections on the western Scottish continental shelf, which were established by Dunstaffnage Marine Laboratory (DML). The triangles and squares indicate the nominal positions of individual Line HD and HE stations respectively. 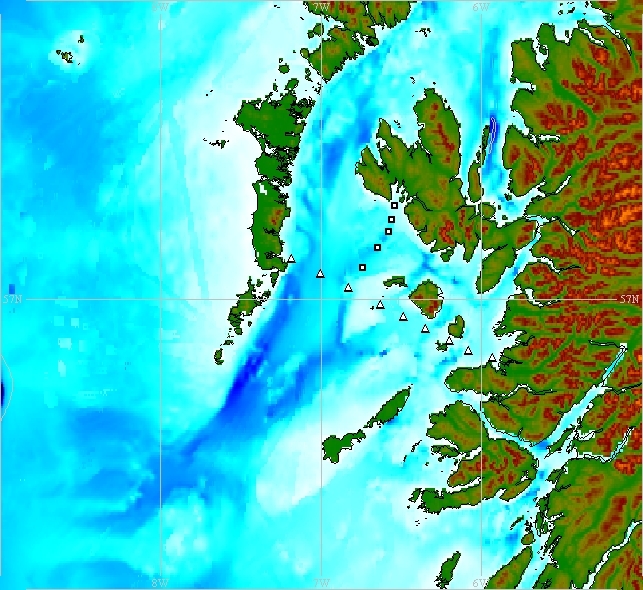 Measurements made at repeated Sea of the Hebrides STD/CTD stations lie within a box bounded by co-ordinates 56.6° N, 7.664° W at the south west corner and 57.313° N, 5.933° W at the north east corner. Several repeated hydrographic stations on the Ellett Line/Extended Ellett Line occupy the southern area of the Sea of the Hebrides. Further information about these survey transects are summarised here.